Meeting the coming challenges in healthcare delivery will require a firm commitment to lifelong learning. The continuing pursuit of knowledge is now critical to achieving high-quality outcomes in the complex environments where nurses practice. 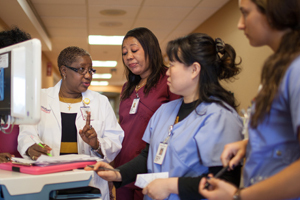 Montefiore cultivates an atmosphere of continuous learning, where nurses are offered ample and ongoing opportunities to educate themselves about ways to maximize patient care, innovation and cutting-edge developments in healthcare. Leadership development seminars designed and conducted by the Division of Education and Organizational Development. Clinical and management continuing education courses, with contact hours awarded. Continuing Education Units for Nursing offered through eLearning modules and at various events throughout Montefiore. Workshops on enhancing communication, problem solving and effective delegating. Management and leadership skills forums and learning circuits. 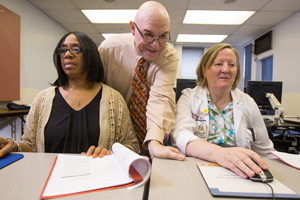 A summer Clinical Assistance Program to nursing students, giving them invaluable hands-on clinical experience, preceptorship with a professional nurse, and a professional development series to advance clinical knowledge. Montefiore’s Nursing Visiting Scholars Program brings national and international leaders to share their vision with our staff. 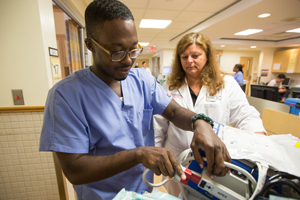 The program addresses core aspects of the profession, including nurse-led innovations in healthcare, transcultural nursing, translational nursing research and the future of nursing as outlined in a recent Institute of Medicine report. We look forward to further hosting and partnering with nursing leaders—an invaluable opportunity as we advance the future of nursing and healthcare.